The Cactus Wren is fun to watch. It is a must see when you visit Arizona. Roadrunner is thought to be the obvious state bird. It is probably the most "seen" bird in Arizona. However, New Mexico had first choice on this bird and beat us to the punch. Our competitive nature wants New Mexico to know that even though New Mexico is 8 days older than Arizona... The "Roadrunner" cartoon series usually depicts him in the desert lands of Northern Arizona in the painted deserts and Grand Canyon lands. We have an amiety and an unofficial notoriety with this raptor. 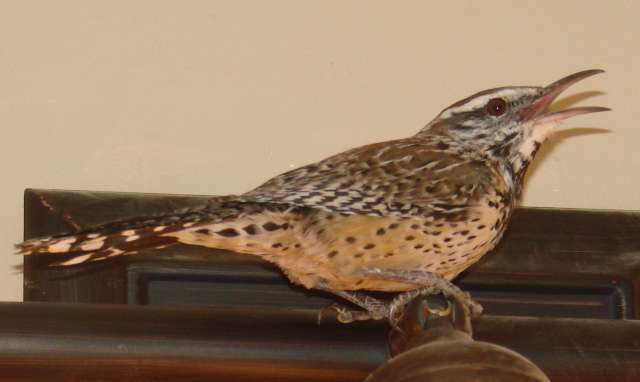 Arizona chose the Cactus Wren as it's state bird officially in 1973. 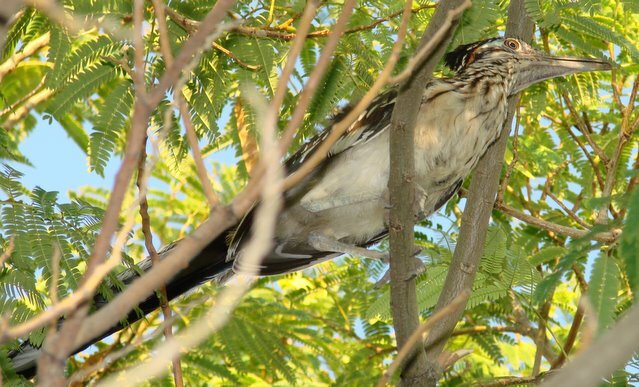 This bird is speckled with white and brown spots. It has striped brown and white tail feathers. Above its eye is a beautiful "eyebrow" marking. It has a beautiful white tuft of fluff below its neck on the breast and belly. You can see these birds on cactus all over the state of Arizona. This wren is bigger than most wrens in the United States it is about 8 inches long from head to tail. You can hear them while hiking in the high deserts or low valleys. They are beautiful to us humans. Come and see one, you'll be glad you did. Bring your field glasses, camera and the video machine. It is phenomenal how such a delicate beautiful bird can maneouver amongst the cactus spines and needles and pokes without injury. This desert wren will usually build several nests but only live in one of them. The other nests are false residences which deter predators. In the top picture this cactus wren was caught in a house being built where it had flown in the house and stunned itself trying to fly through the window pane of glass. It was saved and when it got out of the box we had trouble getting it to the outside because it took refuge in a bathroom. We caught this beautiful bird. 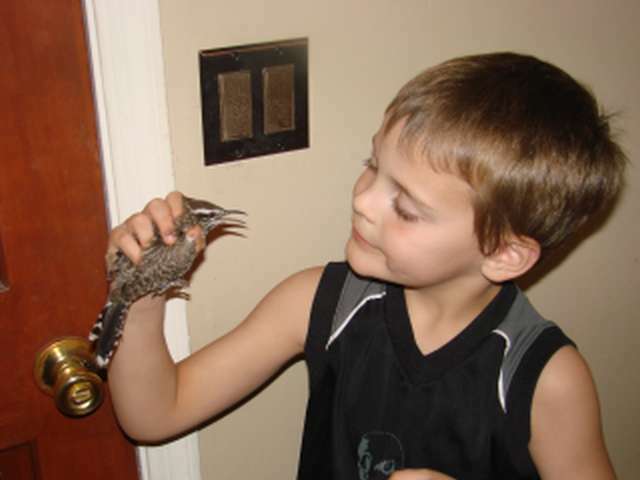 The little boy was ever so gentle and thrilled to meet a cactus wren until it was released. This is a rare occurance. Do not try to capture these birds without a cause because they are protected. You can see them where ever saguaros grow. They are plentiful. Now, we feel compelled to show you our Road Runner. We spotted this fella running down our road so we grabbed the camera but he saw us coming. Somehow he knew the camera was on and these fellas do not like paparazi! We followed him into a yard with a mimosa tree. He suddenly flew up into the tree and actually walked its branches instead of hopping and flying like most birds. He gave us a stare and a chance to catch him on camera. Road runners can fly if they need to but they can't be caught by most predators and humans. They run too fast! You normally would need a telescopic lens to get the full features. This one was absolutely beautiful. We are naming him the "sexiest roadrunner alive"
If you get good picture we will post it here. Roadrunner or Cactus Wren we want to see them.